From the 30th November to 11th December 2015, the eyes of the world will be back on Paris, but thankfully for much more positive, inspiring reasons than the weeks just past. The 21st Conference of the Parties (COP21 for short) will gather together Heads of State from at least 190 countries around the world. COP21 will argue and debate issues that are essential to the health and survival of our planet – the stakes could not be higher. A consensus on action to reduce our greenhouse gas emissions to a level that will result in the rise in global average temperatures NOT exceeding 2 degrees this century is vital! Although arguably the most important meeting in a generation, on the planet, for the planet, it is not clear that the message has got through to all. It seems as if wider society does not have a clear understanding of what COP21 is all about, except for the vague idea that “its something to do with stopping climate change”. Well, we, together with our sister organisation ‘eco action games’, are partnering with a set of well-known environmental partners to change all that with our quirky, upbeat, actions focused ’12 days of COPmas’ communication campaign. 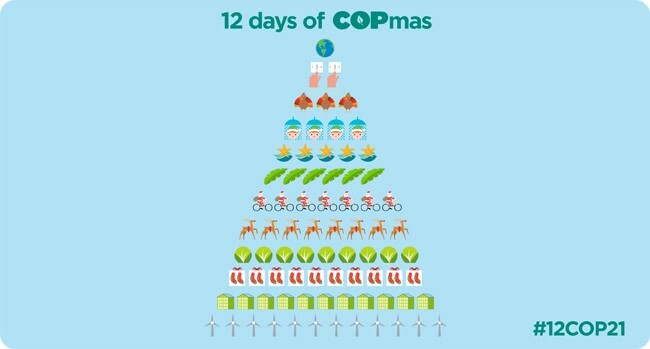 We are launching a new ‘day of COPmas’ for each day of negotiations at COP21. Each day will feature a theme that is of significant importance to COP negotiations. eco action games, alongside the partner of the day, explain why the issue is of significance to COP21, and, because we are eco ACTION games, we then go on to suggest simple ways that: Citizens, Civil Society and Corporations can play their part. We end with a longer thought piece on the topic, for readers who are interested in getting a deeper understanding of the issues. We have started our teaser campaign this week, with our COPmas tree that holds all the clues to which theme we are tackling on each day – see if you can guess what they are? So do join in the fun & games. We are offering a daily prize of an eco action games compendium set for people who Follow, Like, Tweet or Retweet us. The hashtag we are using is #12COP21.